Is Your Hiring Strategy Efficient? If your company cares about hiring smart people, you’re going to have to market to them, and the first way to do that is through your job postings. Lou Alder* takes us through an analysis of how to hire, what he likes to call, an “A-Team.” The achievers. These are the over-performers who consistently exceed their performance expectation. Hiring managers have chimed in by saying how disappointed they were with the quality of candidates sent by their recruiters. They suggested the primary cause as their recruiter’s lack of understanding of real job requirements. “I suggested that this was definitely part of the problem, but just as likely was a quality control issue: using inspection at the end of the process to control quality of hire, rather than defining and controlling at the beginning,” says Alder. 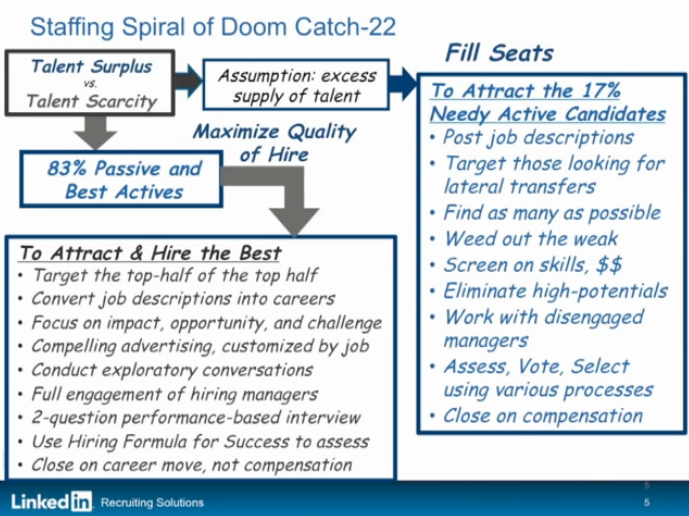 There are two strategies that Lou Alder expresses in “The Staffing Spiral of Doom – Catch 22” that can explain this. 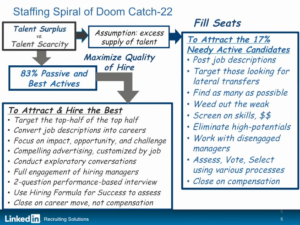 Alder explains the Surplus of Talent Model and the Scarcity of Talent Model and we will see how each model can affect your hiring strategy. The Surplus of Talent Model: This model should be used when the demand of talent is less than the supply. From this, you have a surplus of candidates and to select from. The active candidates are who you target, and from that group you move on to hire the best candidate who applied. The Scarcity of Talent Model: This model should be used when the demand of talent is greater than the supply. The job description should emphasis the ‘doing and becoming’ and mention the impact and challenge of the job. Don’t write job descriptions that will engage lateral transfers! The strategy is to attract the best candidates who have the most potential and raise the talent bar. *Lou Adler is the CEO and founder of The Adler Group – a consulting and training firm helping companies upgrade their talent acquisition programs. Adler is the creator of Performance-based Hiring℠ and the author of the Amazon top-10 best-seller, Hire With Your Head (John Wiley & Sons, 3rd Edition, 2007) and The Essential Guide for Hiring & Getting Hired (Workbench Media, 2013). Posted in Recruiting, Talent management | Comments Off on Is Your Hiring Strategy Efficient?